Over the past few years, a large number of students have selected to study Law Degree. Let’s dig a little deeper and know that why the stream is getting so much hype among students these days. Read on to know the benefits of studying law. Students of law learn numerous skills while studying like they get to know about research with the help of analysis of various case studies, they get strong with their communication skills whether verbal or written through case writings and presentations, and finally get to know the synthesis of complex ideas. The profession of law certainly lies on a lot of theory and students pursuing law have to attentively learn it, but also keep in mind that law is fairly defined profession and demands a lot of practice to win situations. Some Universities and Colleges offering a lot of facilities to the students while making them prepare for the profession through practicing in a mock courtroom, participating in moot competitions which gives students a real tester of how to get ready to jump in a profession. The profession of law is the world’s one of the traditional professionals and pursuing it can give you a life of extreme respect. Apart from choosing stream, the selection of college or university also matters. If you indulge in such a situation, well we’ve got you covered! MMDU has a good reputation and offers an array of opportunities for those who want to study law in North India. Even more, the University has a strong focus on student-centric learning. Apart from that, faculties to teach law are highly professional, educated, and having experience in various specialisms. Best of all, more than 85% percent of graduates from the LLB Courses at MMDU are in work within a few months of completing their course. The University organizes a variety of extra-curricular activities like Moot Courts, Legal Aid Clinic, Paper Presentation, Judgment Writing, Essay Writing, Client Counselling Competition, Human Rights Training Program by National Human Rights Commission, Legal Aid Camp, Regular court visits to district court and High Court, Guest lectures by judges, academicians, advocates, and more to further the law practical studies of the students. 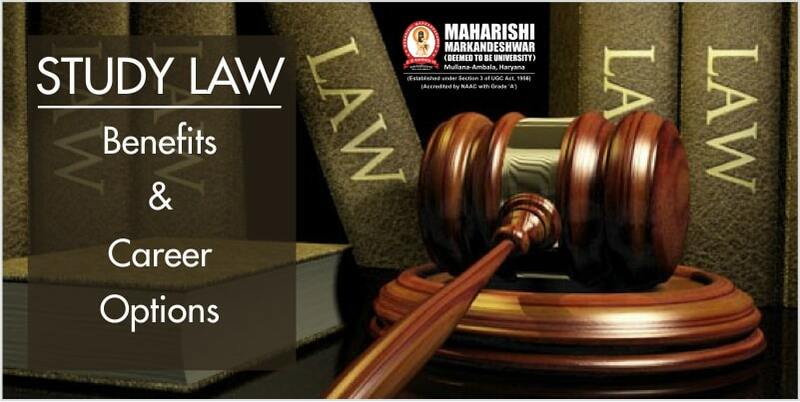 All law degrees in India will teach a mix of civil law, common law, and Indian Law. MMDU teaches students various principles of law through a plethora of subjects, including Constitutional Law, Law of Evidence, Administrative Law, Property Law, Tort and Consumer Protection Laws, Legal Language, Jurisprudence, Right to Information, Intellectual Property Rights, and many more. LLM: Students should have passed LL. B.